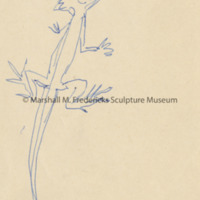 Sketch of lizard, possibly for "The Friendly Dragon" or "Japanese Goldfish, Lizard and Frog Fountain." 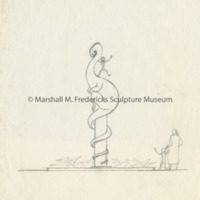 Sketch may be early concept for the sculpture outside the Holden Museum of Living Reptiles at the Detroit Zoological Institute. 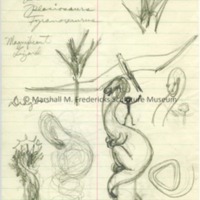 Sketches of iguana, possibly for "The Friendly Dragon". 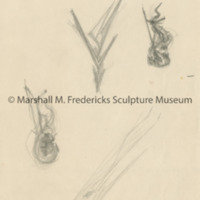 Sketches may be early concepts for the sculpture outside the Holden Museum of Living Reptiles at the Detroit Zoological Institute. 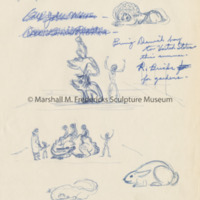 Sketches for "The Friendly Frog" and "The Friendly Dragon". 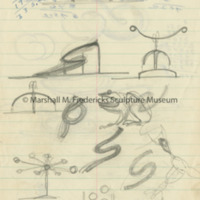 Also includes sketches of whales and playground equipment. 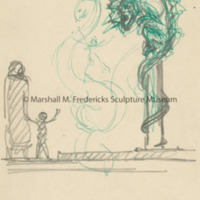 Sketch for "The Friendly Dragon"
Sketch for "The Friendly Frog"
Fredericks designed this large friendly appearing frog as a children’s slide. The original cast of this sculpture was located at the Hudson wing of the Genesee Valley Shopping Center in Flint, Michigan for 16 years where children did use it as a slide. Plaster sections for full-scale friendly dragon. 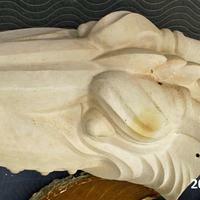 The sections were assembled and the full-scale is on display in the main exhibition gallery. 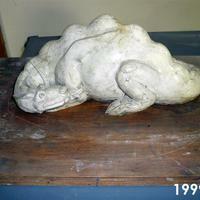 Small plaster model of Friendly Dragon on wood board. 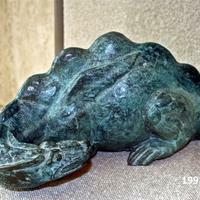 Small-scale bronze Friendly Dragon with green patina.